Lay one sheet of puff pastry on a board and dust it with icing sugar (or, if you're feeling really decadent, spread with chocolate and hazelnut spread). Stack the second sheet on top – using two sheets of dough sandwiched together will give you a better rise in the oven. Trim the pastry edges so the stack is roughly round and then cut it into wedges like a pizza. Arrange a wedge so the tip is pointing towards you and, with both hands, roll it up slowly from the wide, rounded-end to make a croissant shape. Repeat with the other wedges and then lift the croissants onto a baking sheet lined with baking parchment. 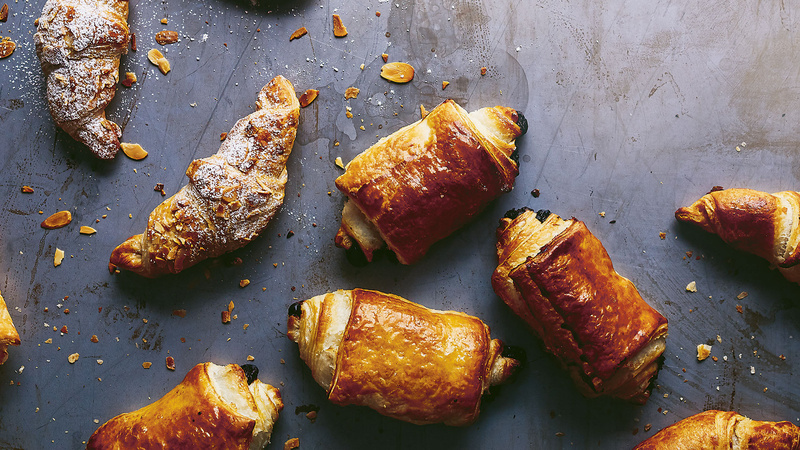 Brush the croissants with egg wash and sprinkle with almonds, if you like. Bake for about 15 minutes or until puffed and golden brown. You can dust them with icing sugar or leave them plain. Use the double puff pastry trick of stacking one sheet on top of the other (described above) but instead cut the stack into 7.5 × 12.5-cm rectangles. Position one rectangle so a short side is facing towards you and lay a stick of chocolate across the pastry, 2.5cm from the top. Start rolling the pastry from the top: after one turn you won't be able to see the chocolate any more – that's good. Flatten the top of the roll gently with your fingers so it becomes oval-shaped. Give the roll a second turn, flattening it slightly again and place a second chocolate stick close to the roll. Give it a final rolland a last press, ensuring the join in the pastry is tucked underneath. Trim off any excess and repeat with the other rectangles and chocolate sticks. Brush the pastry with egg wash and bake for 20 minutes or until puffed and golden brown.